When Filip Forbserg’s goal gave the Nashville Predators a 4-3 overtime win over the Avalanche Sunday afternoon, a couple of things about the reaction stuck with me. One, there seemed to be at least a thousand gold-clad Predators fans again roaring and high-fiving. In Denver, we’re used to transplant fans — whether of the instant lifelong variety or genuinely deep-rooted — of the Blackhawks, Rangers, Red Wings, Bruins … and more. All those Predators fans have moved here, too? One trip to the Stanley Cup Finals and then a terrific regular season in 2017-18 and it’s as if the Predators were in the so-called (but not really) Original Six. Second, the Avs acted as if it was a crushing defeat. Which on the surface, it was. It took Nashville defenseman Ryan Ellis’ soft goal with 1:06 left in regulation with goalie Pekka Rinne out to get it to overtime. The Avs, now 35-24-6, had just lost to a Predators team that has won eight in a row and now has a comfortable lead over Winnipeg in the Central Division. But the Avs went 3-0-1 in the homestand. At the end of the Sunday games, the Anaheim Ducks had jumped into third in the Pacific Division. The Los Angeles Kings had dropped into the second wild-card playoff spot in the Western Conference, with 77 points. The Avalanche was one back. Only one. The Avs are going into the final 17 games effectively in control of their own destiny. That’s about all you can ask. They have a game in hand on the Kings, plus on the pursuing Blues and Flames. It’s ridiculous to raise the possibility of the Avs winning out, of course, except as a measure of their placement in the pack. The chances of that being the case heading into the final month of the season, given the Avalanche’s road-dominated schedule from late January to late February, seemed slight at one point. They’re going to pull it off. They’re going to finish ahead of Los Angeles, St. Louis and Calgary — and/or the other teams that could drop into the second wild-card race — and make the playoffs, where they most likely would face the Predators in the first round. Yes, despite the absence of Erik Johnson with a separated shoulder, they’re going to make the playoffs. 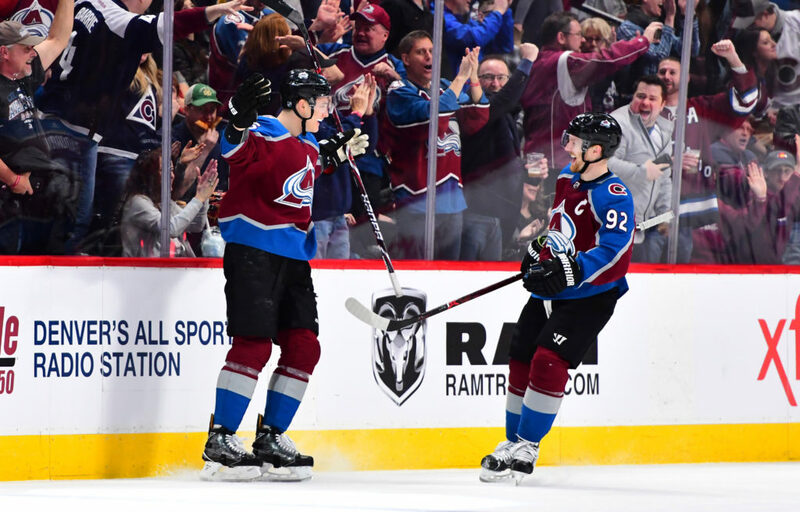 Nikita Zadorov, who had one of the Avalanche goals Sunday (above, celebrating with Gabe Landeskog), will need to meet the challenge in the top pairing. Semyon Varlamov will have to be more stingy than he was Sunday, of course, and the Nathan MacKinnon-centered top line will have to both be productive and get secondary scoring support. But they’re going to make it. Then the key then is not necessarily how far they advance, but whether they treat the franchise’s first playoff experience in four years as a key progressive step as the franchise seeks to get back among the league’s elite. Joe Sakic’s patient approach after coming to grips with the need to reboot will be rewarded. It will be an impressive case of patience leading to a quicker-than-thought-possible turnaround. A year ago, this scenario seemed preposterous. The Avs have a lot to play for in the final month.